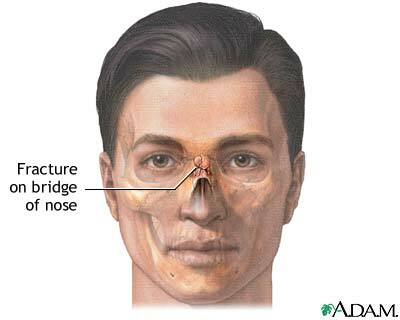 A nasal fracture is a break in the bone over the ridge of the nose. It usually results from a blunt injury and is one of the most common facial fracture. Symptoms of a broken nose include pain, blood coming from the nose, bruising around the eyes, misshapen appearance, swelling, and difficulty breathing through the nose. Serious nose injuries can cause problems that require immediate attention. However, for minor nose injuries, the doctor may prefer to see the victim after the swelling subsides to evaluate the extent of injury.